It is common to consume chufa during summer, because with the chufa we can prepare the most refreshing and healthy beverage for this season. Due to its multiple properties and nutritional values, the use for the chufa has started to expand and it should be included in any daily diet. It is a healthy food, without gluten and with a high content of fiber. A basic requirement for any type of diet: is an important source of non-animal protein, in addition to be a great source of potassium and magnesium. In gastronomy, the chufa is gaining recognition because it has a particular and delightful taste, a distinctive sweetness and intense taste that burst in the mouth, which is juicy but without being cloying, and delights the palate while also being beneficial to our health. 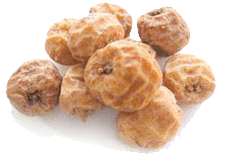 In beverages, plain or mixed with other fruits, the tigernut is perfect to prepare puddings and ice creams. Actually, some people even have tasted the chufa as part of a variant recipe of the traditional Ajoblanco, on which the almonds were substituted with chufas, which were lighter but equally nutritious and easy to eat. Therefore, the chufa is ideal of any type of person regardless of age, gender or condition. Even if eaten alone, the chufa is an exceptional food. Today is possible to find countless ways to exploit this little tuber, many of which were unimaginable many years ago, like beers, oils, chocolates, or nougat. The chufa is gaining an important role in the vegan cuisine and the market of ecological products. So much that now we can find chufa in flour, which can be used in anything we want to. Those who have tasted the chufa flour form say that it is better if mixed with honey or dates, which can be used to produce delightful and healthy cakes, because all the ingredients used are natural. In addition to cakes, other products are being produced, like candies, salty products, creams, and cookies of chufa. The traditional Cocoa and hazelnuts cream for the kids now have competition, a similar cream that go very well along coffee or tea and is made with chufa. And the best thing about chufa is: is a nutrient for all the family, because it is healthy, with a high content of fiber, vitamins, minerals, and without gluten. But there is more: from some time candy makers used chufa to prepare confectionery. Because chufa isn’t totally sweet, it also can be used as an ingredient for the most consistent cakes and mousses, like a mousse of chufa or bacon ice cream, which makes a delightful contrast. For those who prefer salty food, you can try the salty chufa pickled in water with vinegar and flavored with garlic and oregano, or with tornillo and rosemary. In this way, chufa can be added to salads, rice and couscous. With the tigernut, you can develop products suitable for diabetics and celiac, even for people that suffers of high blod pressure. You can combine the chufa with different products and formulas valid for people with different health conditions without completely abandoning the great taste. The chufa contains carbohydrates, fat, fiber, and proteins. Its content of fat is almost the same as the content included in other dry fruits, which is monounsaturated with a high content of Omega 9 oleic acid. The content of oleic acid in the tigernut is almost the same as the one found in olive oil, which digestive properties as well as its functions as an astringent and cardiovascular benefits has been well documented, including its probiotic, restorative, and stimulating effect. Eating chufa increases the immunity of the organism and also is recommended for some cases of malnutrition thanks to its high content of iron, but also for its high content in arginine, an amino acid that is good for patients with anemia. Chufa is recommended for children, for the elderly, for sick people, diabetic, for people with health problems, stress or nervousness, and also for athletes. Thanks to the benefits arginine have on cicatrization, chufa also is recommended for people with constipation or other digestive disorders like ulcers, also the arginine in the chufa helps to control the levels of cholesterol. Chufa doesn’t contain caffeine, stimulants, and it doesn’t produce gases either. For all those reasons, chufa is the ideal beverage for any type of person, especially those who wants to take care of their health, like women with osteoporosis or in pregnancy, which cannot drink soda or alcohol. Also, it doesn't contain lactose, fructose nor gluten in the chufa, so it can be given to children without fearing allergies or any type of intolerance. The chufa is a good source of vitamin C and E, as a good source of calcium, phosphorus, magnesium, potassium, and iron. Chufa also contains starch, non-animal proteins, and enzymes that help with digestion. Chufa was used by the Egyptians 3.000 thousand years ago. It was introduced to Spain by the Arabs in the seventh century. In the sixteenth century people was attributing anti-inflammatory properties in the respiratory tract and it was recommended to ease the stomach. Although we all know the chufa from Valencia, this tuber could have other origins, as the African chufa, which comes from Nigeria, Burkina Faso or Mali, with the difference that it is bigger and it don’t have the same properties. Recently, the farmers are looking for a softer chufa that can be eaten as a legume. Chufa is perfect to accompany any daily diet, not matter if salty or sweet. The chufa is tasty, healthy, and with great benefits to the human being. One recommendation for those who love chufas is trying to reinvent their dishes with new tastes: artisan ice cream, fresh salads, creams, snack, cookies, etc. With a little bit of imagination everything is possible, because the chufa blends with anything. Sadly, the fact that it is high in potassium makes it a bad food for my mother. Thanks. This is a pity, Tiger Nuts are helping a lot people with different alimentary disorders.